Dan Halliday teaches political philosophy at Melbourne University, where he’s worked since completing his PhD at Stanford University in 2011. Earlier in life, he grew up in London and became hooked on philosophy as a teenager and hasn’t got off it since. 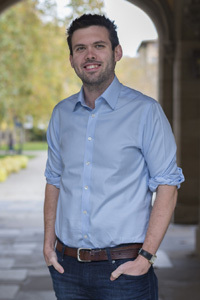 His current research focuses mainly on questions about social justice, especially as it bears on economic matters, such as taxation and markets. His book on the ethics of inherited wealth will be published in late 2017, and he is also working on a textbook about the ethics of capitalist societies. Christian Barry is professor of philosophy at the Australian National University. His work focuses on ethics and issues of international justice. His publications include books with Sanjay Reddy, International Trade and Labour Standards: A Proposal for Linkage (Columbia University Press, 2008), and Gerhard Øverland, Responding to Global Poverty: Harm, Responsibility, and Agency (Cambridge University Press, 2016), and many articles in leading journals. He is co-editor of the Journal of Political Philosophy. Richard Rowland is a senior research fellow at the Australian Catholic University. He was originally a politics student, but his political interests drew him to ask questions about how states can justify policies that harm their citizens and others. And what it means for someone to justify an action to others who are harmed by it and have objections to it; he still doesn’t have the answers. He works on value, the nature of morality, moral disagreement, and experimental philosophy. He has two books coming out in 2019: The Normative and the Evaluative (Oxford University Press) and Moral Disagreement (Routledge). Catherine creates TV documentaries. She has created three TV documentary series for ABC TV, all aimed the youth market. Her TV documentaries have been funded by a number of organisations, including Film Victoria and Seoul Film Commission. Catherine creates video works for specific projects, including ‘Three Photographers’, which premiered at Adelaide International Film Festival and screened in Australia and South Korea as part of the George Rose exhibition. Catherine Gough-Brady also creates audio works that combine real and fictional elements. She has created 11 radio features for ABC Radio National. Her audio work has been funded by the Australia Council. Brigid Evans is a post-graduate research student at the University of Melbourne. Her research in philosophy focuses on educational justice, specifically in relation to the inclusion of students with disability in mainstream classrooms. Her research has been informed by her work as a secondary school philosophy teacher. She began her career as a teacher in Melbourne’s west through Teach for Australia, which places teachers in disadvantaged schools in an effort to combat educational disadvantage. She currently teaches VCE and senior years philosophy in regional Victoria, spending her time debating philosophical ideas with her students and attempting to make philosophy accessible and relevant to teenagers. Snodger Media creates content for TV, radio and print. We specialise in projects about culture and ideas. Our projects are as diverse as creating crosswords for major daily newspapers through to TV series on Australian law. Snodger Media specialises in creating documentaries aimed at the youth market (13-20 yo). Snodger Media is co-owned by Tess Brady and Catherine Gough-Brady.